The present study was carried out to investigate the antioxidant potential, total flavonoid and phenolic content in extracts of aerial parts of Cordia retua(Vahl.) Masam. The samples such as ethyl acetate and ethanol extracts were tested using six in vitromodels such as 2,2-diphenyl-1-picrylhydrazyl, nitric oxide radical, iron chelating, hydroxyl radical, superoxide radical scavenging activity and total antioxidant activity to evaluate the in vitro antioxidant potential of C. retusa by spectrophotometrically. Total flavonoid and phenolic content in samples were estimated using aluminum chloride colorimetric and Folin-Ciocalteu method. The results were analyzed statistically by the regression method. Half maximal inhibitory concentration (IC 50) of the ethanol extract was found to be 596 μg/ml for DPPH, 597 μg/ml for nitric oxide radical, 554 μg/ml for iron chelating, 580 μg/ml for hydroxyl radical, 562 μg/ml for superoxide radical and 566 μg/ml for total antioxidant capacity. Furthermore, the total flavonoid content and total phenolic content of the ethanol extract were found to be 2.71 mg gallic acid equivalent per gram of extract and 1.86 mg quercetin equivalent per gram of extract, respectively. In all the testing, a significant correlation existed between concentrations of the extract and percentage inhibition of free radicals. The results of the present comprehensive analysis demonstrated that C. retusapossess potent antioxidant activity, high flavonoid and phenolic content. The antioxidant property may be related to the polyphenols and flavonoids present in the extract. These results clearly indicated that C. retusa is effective against free radical mediated diseases as a natural antioxidant. Consuming greater amount of antioxidant rich foods might help to protect against diseases which is suggested by various dietary research findings. Antioxidants are substances that control or obstruct the oxidation of cellular oxidizable substrates. They employ their effect by scavenging reactive oxygen species (ROS), and blocking the generation of ROS. ROS are free radicals involved in many human diseases. Superoxide anion radical (O2 – ), the hydroxyl radical (OH ) and hydrogen peroxide (H2O2) are the most common kind of ROS. In modern decades, focus on plant research has extended all over the globe. Gathered data exposed the immense potential of medicinal plants applied in various traditional systems, for their biological actions and antioxidant principles. Cordia retusa (Vahl.) Masam (Family: Boraginaceae) is an evergreen shrub to undersized tree. The leaves are in clusters of 3-5, blade obovate or oblanceolate. Flowers are 3-12 flowered scorpioid cymes, unbranched or branched once. Fruit is globose, 4-5 mm in diameter, ripening fruits are brownish orange in color. The plant C. retusa disseminated widely in eastern and southeastern Asia from India, Sri Lanka, Burma, Thailand, Indochina, China, Taiwan, Sumatra, Malaysia, Java, Philippines. It was reviewed that the C. retusa leaf decoction is being used to treat cough and stomach ache, root as antidote. The sap of the leaves is taken internally for three days prior to and later than the menstrual period for three to four months to strengthen fertility. The leaves are used to make a tea which is used for abdominal colic and for the treatment of diarrhea and dysentery. Further, the leaves are antiinflammatory. The total antioxidant potential of plant extracts cannot be assessed by using a single method, due to the complex constitution of phytochemicals as well as oxidative processes. Hence the present study was designed to estimate the antioxidant activity of ethyl acetate and ethanol extracts of aerial parts of Cordia retusa (Vahl.) Masam through a number of in vitro models like 2,2-diphenyl-1-picrylhydrazyl (DPPH), nitric oxide radical, iron chelating, hydroxyl radical, superoxide radical scavenging activity and total antioxidant activity. Further an attempt has also been made to find the relationship between flavonoid, phenolic content and antioxidant activity of this plant. The aerial parts of plant C. retusa were collected from the natural habitats of Kalakad, Thirunelveli District of Tamilnadu, India. The plant was authenticated by botanist at Central council for research in Ayurveda and Siddha, Government of India and the voucher specimen number T135 has been deposited in the herbarium of Entomology research Institute, Loyola College, Chennai (India). The samples were washed thoroughly in running tap water to remove soil particles and adhered debris and finally washed with sterile distilled water. The aerial parts of the plant were shade dried and ground into fine powder. The powdered materials were stored in air tight polythene bags until use. Extraction process was carried out with Pet. ether, ethyl acetate and ethanol for 4, 12 and 48 h, respectively using soxhlet apparatus by weighing 500 g of powdered sample. The extracts were collected and concentrated under reduced pressure in a rotary evaporator. All extracts were kept in desiccators until use. Percentage yield of the extracts were shown in fig.1. From the above three extracts, ethyl acetate and ethanol extract were selected for the determination of antioxidant activity by using different in vitro models. All the experiments were performed with different concentrations ranging from 125 to 1000 μg/ml (125, 250, 500 and 1000 μg/ml) in triplicates. 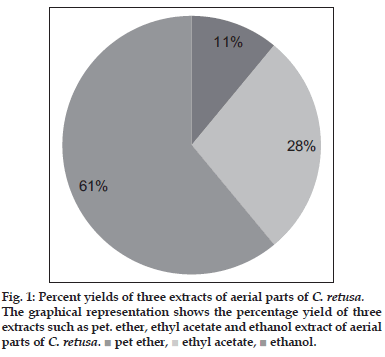 Figure 1:Percent yields of three extracts of aerial parts of C. retusa. The graphical representation shows the percentage yield of three extracts such as pet. ether, ethyl acetate and ethanol extract of aerial parts of C. retusa. pet ether, ethyl acetate, ethanol. The effect of extracts on DPPH radical was assayed using the Mensor method. A methanol solution of 0.5 ml of DPPH (0.4 mM) was added to 1 ml of the different concentrations of two extracts and allowed to react at room temperature for 30 min. Methanol served as a blank and DPPH in methanol without the extracts served as positive control. Rutin used as standard. After 30 min, the absorbance was measured at 518 nm and converted into percentage radical scavenging activity as follows. Scavenging activity (%)=((A518 Control-A518 Sample)/A518 Control)×100, where, A518 control is the absorbance of DPPH radical+methanol; A518 sample is the absorbance of DPPH radical+sample extract/standard. The compound sodium nitroprusside is known to decompose in aqueous solution at physiological pH (7.2) producing NO . Under aerobic conditions, NO reacts with oxygen to produce nitrate and nitrite. The quantities of which can be determined using Griess reagent. According to the method 2 ml of 10 mM sodium nitroprusside was dissolved in 0.5 ml of phosphate buffer saline (pH 7.4) and mixed with 0.5 ml of different concentrations of two extracts. The mixture was then incubated at 25°. After 15 min of incubation, 0.5 ml of the incubated solution is withdrawn and mixed with 0.5 ml of Griess reagent (1.0 ml sulfanilic acid reagent (0.33% in 20% glacial acetic acid at room temperature for 5 min) with 1 ml of naphthylethylenediamine dichloride (0.1% w/v)). The mixture was then incubated at room temperature for 30 min and its absorbance was measured at 546 nm. Ascorbic acid was used as a control. The amount of nitric oxide radical inhibition was calculated by this Eqn. Percent inhibition of NO =[A0-A1]/A0×100, where A0 is the absorbance before reaction, A1 is the absorbance after the reaction has taken place with Griess reagent. The Benzie and strain method was adopted for the assay. The principle is based on the formation of O-Phenanthroline-Fe2+ complex and its disruption in the presence of chelating agents. The reaction mixture containing 1 ml of 0.05% o-phenanthroline in methanol, 2 ml ferric chloride (200 μM) and 2 ml of different concentrations of two extracts were incubated at room temperature for 10 min and the absorbance of the same was measured at 510 nm. EDTA was used as a classical metal chelator. Percent inhibition of Fe radical=[A0-A1]/A0×100, where A0is the control absorbance, A1 is the test absorbance. This was assayed as described by Elizabeth and Rao method. The assay is based on the quantification of degradation product of 2-deoxy ribose by condensation with TBA. Hydroxyl radical was generated by the Fe3+-Ascorbate–EDTA–H2O2 system (Fenton reaction). The reaction mixture contained 0.1 ml deoxydribose (2.8 mM), 0.1 ml EDTA (0.1 mM), 0.1 ml H2O2 (1 mM), 0.1 ml ascorbate (0.1 mM), 0.1 ml KH2PO4-KOH buffer, pH 7.4 (20 mM) and different concentrations of two extracts in a final volume of 1 ml. The reaction mixture was incubated for 1 h at 37°. One milliliter of TBA (1%) and 1 ml of trichloroacetic acid (2.8%) are added and incubated at 100° for 20 min. After cooling, absorbance was measured at 532 nm, against a blank. Percent inhibition of OH radical=[A0-A1]/A0×100, where A0 is the absorbance of control, A1 is the absorbance of the test. Superoxide radical (O2– ) was generated from the photo reduction of riboflavin and was deducted by nitro blue tetrazolium dye (NBT) reduction method. Measurement of superoxide anion scavenging activity was performed based on the method described by Winterbourne. The assay mixture contained sample with 0.1 ml of 1.5 mM NBT solution, 0.2 ml of EDTA (0.1M), 0.05 ml riboflavin (0.12 mM) and 2.55 ml of 0.067 M phosphate buffer. The control tubes were also set up where in DMSO was added instead of samples. The reaction mixture was incubated at 25° for 5 min and the absorbance was measured at 560 nm against the blank. Percent inhibition of O2– =[A0-A1]/A0×100, where A0 is the absorbance of control, A1 is the absorbance of the test. The antioxidant activity of the extracts was evaluated by the transformation of Mo (VI) to Mo (V) to form phosphomolybdenum complex. An aliquot of 0.4 ml of various concentrations of two extracts was mixed in a vial with 4 ml of reagent solution (0.6 M sulfuric acid, 28 mM sodium phosphate and 4 mM ammonium molybdate). The vials were capped and incubated in a water bath at 95° for 90 min. After cooling the samples to room temperature, the absorbance of the mixture was read at 695 nm against a blank. The antioxidant activity was expressed relative to that of ascorbic acid. The total flavonoid content was determined by aluminum chloride method. The reaction mixture (3.0 ml) that comprised of 1.0 ml of extract (1:10 dilution), 0.5 ml of aluminum chloride (1.2%) and 0.5 ml of potassium acetate (120 mM) was incubated at room temperature for 30 min and absorbance was measured at 415 nm. The total flavonoid content was expressed in terms of quercetin equivalent (mg/g). The total phenol content was determined by Folin-Ciocalteu reagent method. Extract (0.5 ml of 1:5 dilution) and 0.1 ml of Folin-Ciocalteu reagent (0.5 N) were mixed and incubated at room temperature for 15 min and 2.5 ml saturated sodium carbonate was added. This was incubated for 30 min at room temperature and absorbance was measured at 760 nm. The total phenol content was expressed in terms of gallic acid equivalent (mg/g). Total antioxidant capacity of the plant using different concentrations in the range 125-1000 μg/ml of the ethyl acetate and ethanol extract of C. retusawere tested for free radical scavenging property by means of various in vitro models. In all figures, EE and EAE represent ethanol and ethyl acetate extracts of C. retusa, respectively. The DPPH scavenging capacity of the ethanol and ethyl acetate extract of C. retusa showed 74.13 and 67.38% inhibition at 1000 μg/ ml, whereas for rutin (standard) was found to be 84.86% at 1000 μg/ml and that was depicted in fig. 2. It was revealed that free radicals were scavenged by extracts in a concentration-dependent manner. The IC50 value of ethanol and ethyl acetate extract of C. retusawere found to be 596 and 647 μg/ml which was less than the standard rutin (IC50, 514 μg/ml). The NO scavenging capacity of the ethanol and ethyl acetate extract of C. retusa showed 69.38 and 66.74% inhibition at 1000 μg/ml, whereas for ascorbic acid (standard) was found to be 76.78% at 1000 μg/ml and that was illustrated in fig. 3. The IC50 value of ethanol and ethyl acetate extracts of C. retusawere found to be 597 and 655 μg/ml which was less than the standard ascorbic acid (IC50, 532 μg/ml). The iron chelating capacity of the ethanol and ethyl acetate extract of C. retusa showed 77.89 and 82.67% inhibition at 1000 μg/ml, whereas for EDTA (standard) was found to be 86.78% at 1000 μg/ml and that was presented in fig. 4. The IC50 value of ethanol and ethyl acetate extract of C. retusa were found to be 554 and 520 μg/ml which was less than the standard ascorbic acid which shows IC50 480 μg/ml. The OH scavenging capacity of the ethanol and ethyl acetate extract of C. retusa showed 69.87 and 61.78% inhibition at 1000 μg/ml, whereas for ascorbic acid was found to be 76.78% at 1000 μg/ml and that was demonstrated in fig. 5. The IC50 value of ethanol and ethyl acetate extract of C. retusa were found to be 580 and 656 μg/ml which was less than the standard ascorbic acid ( IC50 , 532 μg/ml). Figure 2:DPPH free radical scavenging activity of C. retusa extracts in comparison with rutin. The graphical representation of DPPH free radical scavenging activity of ethanol extract (EE) and ethyl acetate extract (EAE) of C. retusa in comparison with standard rutin. Values are expressed as mean±standard deviation (n=3).- - Rutin, - - ethanol extract, - - ethyl acetate extract. The O2– scavenging capacity of the ethanol and ethyl acetate extract of C. retusashowed 73.65 and 65.76% inhibition at 1000 μg/ml, whereas for ascorbic acid (standard) was found to be 77.96% at 1000 μg/ ml and that was presented in fig. 6. It was revealed that free radicals were scavenged by extracts in a concentration-dependent manner. TheIC50 value of ethanol and ethyl acetate extract of C. retusawere found to be 562 and 615 μg/ml which was less than the standard ascorbic acid (IC50, 525 μg/ml). Total antioxidant activity of the ethanol and ethyl acetate extract of C. retusa showed 72.12 and 64.68% inhibition at 1000 μg/ml, whereas for ascorbic acid (standard) was found to be 82.98% at 1000 μg/ml and that was presented in fig. 7. The IC50 value of ethanol and ethyl acetate extract of C. retusa were found to be 566 and 629 μg/ml which was less than the standard ascorbic acid (IC50, 502 μg/ml). The total amount of phenols and flavonoids content of ethanol and ethyl acetate extract of C. retusa were depicted in Table 1. Figure 3: NO scavenging activity of C. retusa extracts in comparison with ascorbic acid. The graphical representation of NO scavenging activity of ethanol extract (EE) and ethyl acetate extract (EAE) of C. retusa in comparison with standard ascorbic acid. Values are expressed as mean±standard deviation (n=3). Ascorbic acid, - - ethanol extract, - - ethyl acetate extract. Figure 4: Iron chelating activity of C. retusa extracts in comparison with EDTA. 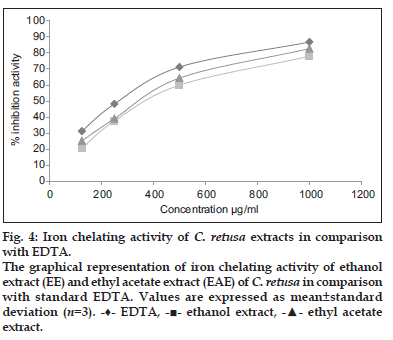 The graphical representation of iron chelating activity of ethanol extract (EE) and ethyl acetate extract (EAE) of C. retusa in comparison with standard EDTA. Values are expressed as mean±standard deviation (n=3). EDTA, - - ethanol extract, - - ethyl acetate extract. Figure 5:OH scavenging activity of C. retusa extracts in comparison with ascorbic acid. The graphical representation of OH scavenging activity of ethanol extract (EE) and ethyl acetate extract (EAE) of C. retusa in comparison with standard ascorbic acid. Values are expressed as mean±standard deviation (n=3). Ascorbic acid, - - ethanol extract, - - ethyl acetate extract. Figure 6:O2– scavenging activity of C. retusa extracts in comparison with ascorbic acid. The graphical representation of O2– scavenging activity of ethanol extract (EE) and ethyl acetate extract (EAE) of C. retusa in comparison with standard ascorbic acid. Values are expressed as mean±standard deviation (n=3). Ascorbic acid, - - ethanol extract, - - ethyl acetate extract. Figure 7:Total antioxidant activity of C. retusa extracts in comparison with ascorbic acid. 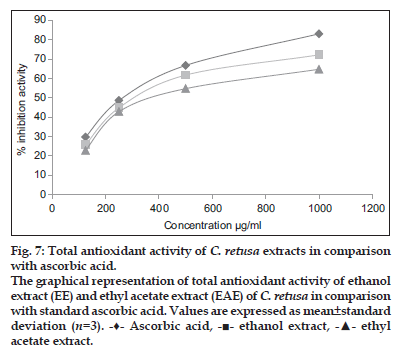 The graphical representation of total antioxidant activity of ethanol extract (EE) and ethyl acetate extract (EAE) of C. retusa in comparison with standard ascorbic acid. Values are expressed as mean±standard deviation (n=3). Ascorbic acid, - - ethanol extract, - - ethyl acetate extract..
Table 1: The total amount of phenols and flavonoids content of ethanol and ethyl acetate extracts of cordia retusa. Oxidative stress (OS) is due to an imbalance between prooxidants and antioxidants. Normal pro-oxidant molecules, including reactive oxygen species (ROS) and reactive nitrogen species (RNS) are free radicals in aerobic metabolism. Physiological concentrations of free radicals are needed to initiate normal progression of fertilization, and embryo development. Even if, above physiological levels of free radicals can result in oxidative stress, which leads to sperm or ovum damage, deformity, endometriosis, miscarriage and infertility. In traditional societies nutrition and health care ar powerfully interrelated and many plants have been consumed both as food and for medicinal purposes. The utilization of non-cultivated plants play a central role in the diet, but very few ethnopharmacological and phytochemical studies have accorded in detail with the potential health benefits of such plants. From the leaves of C. retusa an antimutagenic compound was isolated. An antiallergic dimeric prenylbenzoquinones were separated from Ehretia microphylla. Ehretianone, a quinonoid xanthene, together with known sterols, was isolated from the extract of root bark of Ehretia buxifolia and antisnake venom activity against Echis carinatus venom in mice is also accounted. The isolated triterpene mixture, namely, α-amyrin, β-amyrin, and baurenol from leaves ofC. retusaexhibited analgesic activity and antiinflammatory activity. Hence the aerial parts of C. retusawere used for the in vitro antioxidant study. In this research, the potential sources of the antioxidants, total phenols and flavonoids in the plant C. retusa were studied. Antioxidant activity should not be concluded based on a single test model. In order to confirm the antioxidant potentials of the C. retusa extract, the present study employed different in vitro models, such as DPPH, NO , OH ,O2– scavenging, iron chelating and total antioxidant activity. The DPPH antioxidant assay is based on the capability of 1,1-diphenyl-2-picryl-hydrazyl (DPPH), a stable free radical, to decolorize in the presence of antioxidants. The DPPH radical has an odd electron, which is accountable for the absorbance at 517 nm and also for a visible deep purple color. When DPPH accepts an electron provided by an antioxidant molecule, the DPPH is decolorized, that can be quantitatively measured from the changes in absorbance. The antioxidant properties on DPPH radical scavenging was thought to be due to their hydrogen donating ability. The hydroxyl radical is the most reactive of the reactive oxygen species (ROS), and it has the shortest half-life compared with other ROS. The highly reactive hydroxyl radical can cause oxidative damage to DNA, lipids, and proteins. The fenton reaction generates hydroxyl radicals (OH ) which degrade DNA deoxyribose, using Fe2+ salts as an important catalytic component. Superoxide anion shows a vital role in plant tissues and is concerned in the formation of other celldamaging free radicals. Superoxide anion scavenging activity can be correlated with high content of flavonoids. The study suggested that the flavonoids may be involved in the dismutation of superoxide anion radical. Hydrogen peroxide even if a weak oxidizing agent, it is vital because of its ability to penetrate biological membranes, once inside the cell it can probably react with Fe2+ and Cu2+ ions to form hydroxyl radical and this may be the origin of many of its toxic effects. Plant phenolics and flavonoids are extensively dispersed in plant tissues as well as contribute a vital function in free radical scavenging and antioxidant activity. Natural antioxidants increase the antioxidant capacity of the plasma and reduce the risk of diseases. Flavonoids have been shown to exhibit the action through effects on the permeability of the membrane, and by the hindrance of membrane-bound enzymes such as the phospholipase and ATPase. The antioxidant activity of phenolic compounds is mostly due to their redox characteristics, which can play a vital role in quenching singlet and triplet oxygen, neutralizing and absorbing free radicals or decomposing peroxides. In ethanol extract total phenolics and flavonoids, which contain hydroxyl functional groups, were higher when compared to ethyl acetate extract. Since phenolics and flavonoids are accountable for the antioxidant activity, and high amount present in the extract specifies good antioxidant activity. Female patients who suffer from hypogonadotropic hypogonadism (HH) connected with amenorrhea, anovulation, and infertility which may be attributed to the iron effect on the pituitary gland as well as on the female reproductive system. Treatment with a combination of antioxidants and iron chelators could probably neutralize the deleterious effects of ROS and maybe reverse endocrine problems, improving reproductive capability and fertility potential. From the report it was revealed that the potential of the extracts of different scavenging properties in different in vitro models, denoting that they may be valuable therapeutic agents for managing free radical-related pathological damage. From the above results and discussion, it can be concluded that the ethanol extract of C. retusa acquires the potent antioxidant substances which may be responsible for its activity as well as rationalize the basis of using this plant extract as folkloric remedies. Even though the scavenging activity of the extracts was appreciably lower than those of standard antioxidant, but it was evidence that the extract did prove the proton-donating ability and could serve as free radical inhibitors probably as primary antioxidants. This study recommended that the ethanol extract of C. retusa might be helpful in preventing or slowing the progress of various types of ailments. Advance studies are needed to explicate the exact mechanistic pathway and the isolation of various active compounds responsible for the antioxidant as well as fertility potentials of C. retusa. Authors would like to thank Dr. V. Chelladurai, Research officer-Botany (Retd. ), Central council for research in Ayurveda and Siddha, Government of India, for authentication of plant material. The author, M. Amudha was grateful to the University Grant Commission, New Delhi, India for providing UGC-BSR fellowship. Antioxidants and Health: An Introduction. National Center for Complementary and Alternative Medicine. U.S. Department of Health and Human Services; 2012. Available from: http://www.nlm.nih.gov/ medlineplus/antioxidants.html. [Last updated on 2014 Jun 16]. Michael JS, Kalirajan A, Padmalatha C, Singh AJ. In vitro antioxidant evaluation and total phenolics of methanolic leaf extracts of Nyctanthesarbor-tristis L. Chin J Nat Med 2013;11:484-7. Agarwal A, Allamaneni SS. Role of free radicals in female reproductive diseases and assisted reproduction. Reprod Biomed Online 2004;9:338-47. Garg D, Shaikh A, Muley A, Marar T. In vitro antioxidant activity and phytochemical analysis in extracts of Hibiscus rosa-sinensis stem and leaves. Free Radic Antioxid 2012;2:41-6. Lorence DH, Flynn TW, Wagner WL. Contributions to the Flora of Hawai’i. III. Bishop Mus Occas Pap 1995;41:19-58. Starr F, Starr K, Loope L. Carmona retusa, Boraginaceae. United States Geological Survey-Biological Resources Division Hawai’I; 2003. Available from: http://www.starrenvironmental.com/publications/species./ carmona_retusa.pdf. [Last updated on 2013 May 20]. Amudha M, Rani S. GC-MS Analysis of bioactive components of Cordia retusa (Boraginaceae). Hygeia J Drug Med 2014;6:12-9. Mensor LL, Menezes FS, Leitão GG, Reis AS, dos Santos TC, Coube CS, et al. Screening of Brazilian plant extracts for antioxidant activity by the use of DPPH free radical method. Phytother Res 2001;15:127-30. Elizabeth K, Rao MN. Oxygen radical scavenging activity of curcumin. Int J Pharm 1990;58:237-40. Winterbourn CC, Hawkins RE, Brian M, Carrell RW. The estimation of red cell superoxide dismutase activity. J Lab Clin Med 1975;85:337-41. McDonald S, Prenzler P, Robards K. Phenolic content and antioxidant activity of olive extracts. Food Chem 2001;73:73-84. Rong-zhen Z, Dao-wei Z. Oxidative stress and role of natural plant derived antioxidants in animal reproduction. J Integr Agric 2013;12:1826-38. Salah N, Miller NJ, Paganga G, Tijburg L, Bolwell GP, Rice EC. Invitro free radical scavenging activity of methanol extract of the leavesof Mimusops elengi linn. Bangladesh J Vet Med 2008;6:197-202. Villaseñor IM, Edu DA, Bremner JB. Structure of an antimutagen from Carmona retusa leaves. Carcinogenesis 1993;14:123-5. Yamamura S, Simpol LR, Ozawa K, Ohtani K, Otsuka H, Kasai R, et al. Antiallergic dimeric prenylbenzoquinones from Ehretiamicrophylla. Phytochemistry 1995;39:105-10. Selvanayagam ZE, Gnanavendhan SG, Balakrishna K, Rao RB,Sivaraman J, Subramanian K, et al. Ehretianone, a novel quinonoid xanthene from Ehretia buxifolia with antisnake venom activity. J Nat Prod 1996;59:664-7. Villaseñor IM, Canlas AP, Faustino KM, Plana KG. Evaluation of the bioactivity of triterpene mixture isolated from Carmona retusa(Vahl.) Masam leaves. 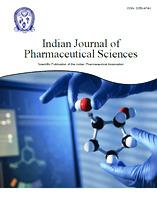 J Ethnopharmacol 2004;92:53-6. Deepalakshmi K, Mirunalini S, Krishnaveni M, Arulmozhi V. In vitro and in vivo antioxidant potentials of an ethanolic extract of Ganoderma lucidum in rat mammary carcinogenesis. Chin J Nat Med2013;11:621-7. Sahoo S, Ghosh G, Das D, Nayak S. Phytochemical investigation and in vitro antioxidant activity of an indigenous medicinal plant Alpinianigra B.L. Burtt. Asian Pac J Trop Biomed 2013;3:871-6. Banerjee SK, Bonde CG. Total phenolic content and antioxidant activity of extracts of Bridelia retusa spreng bark: Impact of dielectric constant and geographical location. J Med Plant Res 2011;5:817-22. Rachmilewitz EA, Weizer-Stern O, Adamsky K, Amariglio N, Rechavi G, Breda L, et al. Role of iron in inducing oxidative stress in thalassemia: Can it be prevented by inhibition of absorption and by antioxidants? Ann N Y Acad Sci 2005;1054:118-23.